Oh Rainbow! Melt into my heart in the way that only rainbows can! Look how their colours reflect the glory of the earth. Look how they come into being. Magically. With only a few drops of water and a beam of light. They sing the song of lightness and grace. They sing the song of peace and tranquillity . They sing the heart song of the soul. They are the soul made visible. Their essence is light and colour. Their vibration peace, and calm and stillness. And often, though not always, they show themselves after stormy, turbulent and thunderous times. 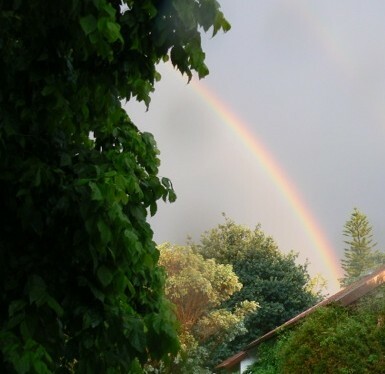 If I were to speak to a rainbow for you, I am sure it would say that it is so glad to meet you. That it is charmed that you have taken a moment to admire its graceful arch and translucent beauty. And it would feel gratitude that you have given it some of your attention, which in this busy world, is a precious commodity. And I am sure, that in a like fashion when you are lost in that moment of observation, the rainbow will itself be well aware of you. And in a like fashion, it will admire your beauty and your astonishing light of which for the most part you are unaware. But consider this, how can you know the essence of something unless its essence lies within yourself? How can you know hate, if you do not harbor some of it yourself? How can you know love if you don’t have any experience of it within you? How can you recognize genius if you have not glimpsed it within yourself ? The beauty of the rainbow wishes to reflect to us our own beauty, our own magnificent light, our own kaleidoscope of glorious colour, our own expansive, perfect arch of symmetry. “Look at me and see, with fresh eyes washed clean from the dust of daily life. See with eyes rinsed by the cool splashy raindrops. See your own essence of wonder reflected by me back to you.